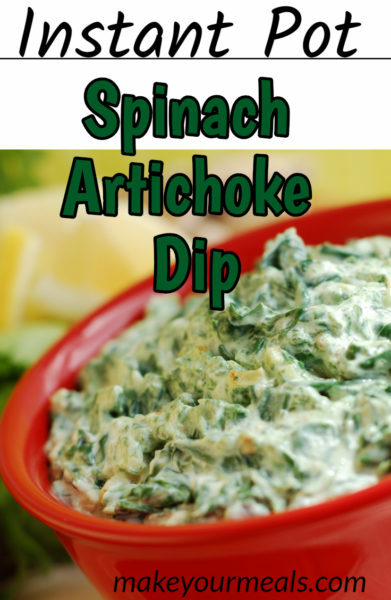 Instant Pot spinach artichoke dip is one of the easiest recipes that you will ever make! This classic appetizer features cooked spinach and diced artichokes in a creamy and cheesy sauce that everyone will love! Even if you don’t think they will! 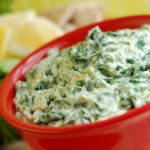 I can remember the first time that I took a bite of spinach artichoke dip. I was in my mid 20’s and I wanted nothing to do with odd looking green veggies. And that even included when they were camouflaged in a bed of cheese! So when my friend ordered an appetizer for us to split, I was in shock when I saw a white oval dish appear. I was thinking a great appetizer would be a plate full of nachos and nacho dip, a few chicken wings, or even roasted red pepper hummus. 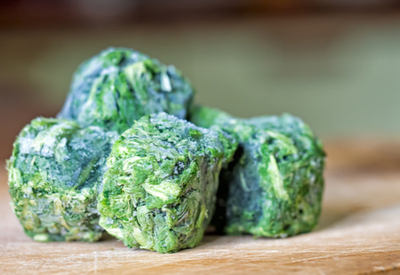 We use store bought blocks of frozen spinach from the store or our garden. But much to my surprise, spinach artichoke dip appeared in the center of platter filled with nacho chips and toasted baguette slices. I was starving, and yet, I was digging my heels in and refused to try the dip. I would grab a chip and a piece of bread, but there was no way that I wanted to eat cooked spinach and artichokes as my appetizer! That was until the server asked how we were enjoying our appetizer. My friend expressed her love for the dip and explained that it was ‘the best ever’. A five minute conversation occurred between the two of them, just raving how this spinach artichoke dip was like no other! That interaction convinced me that I would be doing a disservice to myself if I didn’t give this dip a try! I found the corner of the oval porcelain dish that had the most cheese, and yes, the least amount of green vegetables. When making Instant Pot Spinach Artichoke Dip cut large chunks of artichokes into smaller pieces for easy eating. I scooped my chip in that exact location, expecting the worst taste ever! That first bite had me hooked!! I continued to eat the dip, including scoops full of spinach and artichokes. All I could think to myself was why I didn’t try this sooner! So I began making the dip at home. I mixed all the ingredients and placed them in the oven to heat up. I had to carefully watch it while it was baking so that the cheese didn’t burn before the rest of the dip was cooked. But the taste was outstanding! I began serving it at all parties, picnics and pot lucks and I always brought a clean dish home. In fact, I was asked to make this dip while a group of us were camping. The only problem, I didn’t have access to a stove. Yes, I could have tried it over the campfire, but although I like some foods to have that smokey taste, I wasn’t sure that the spinach artichoke dip would taste good if cooked that way. Plus, I was smart enough to bring my Instant Pot 6 quart Duo with me! So instead, I made Instant Pot Spinach Artichoke Dip! This dip was actually easier to make than when I used the stove. Just throw everything in, cook for 4 minutes, and stir in the cheese at the end. No heating up the kitchen and no need for a careful watch to make sure the cheese didn’t burn! And the taste – OUTSTANDING! *Although I made this in the 6 quart Instant Pot, this recipe would be perfect for the Instant Pot 3 quart mini! 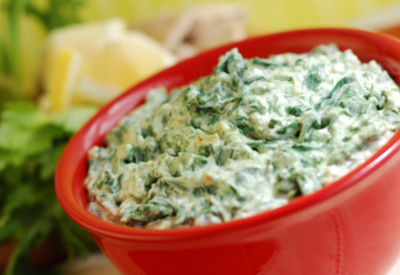 Cheesy Spinach and Artichoke dip recipe that is a fantastic addition to any party! Place chicken broth and minced garlic cloves in the Instant Pot. 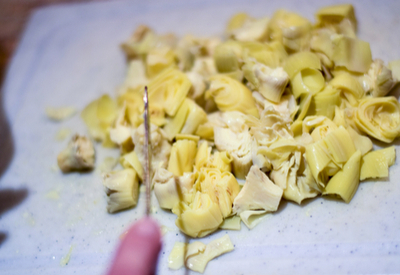 Drain the artichokes in a colander and add them to the chicken broth mixture. Add in the frozen spinach, sour cream, cream cheese, mayonnaise and onion powder in the Instant Pot. Once the cooking time expires, quick release the pressure. Remove the lid and stir in the Parmesan and mozzarella cheese until melted. Transfer to a serving bowl and let cool 5-10 minutes. The mixture will thicken as it cools. If you like your dip thicker, add more cheese. Serve with tortilla chips, pita bread, baguette, or veggie strips. ← Asian Beef and Broccoli Recipe – Better Than Take Out!